Destin Water Fun Pontoon Boat & WaveRunner / Jet Ski Rentals offers the best watersports rentals in Destin, FL both in quality and price. Our waverunner / jet ski rentals are well-maintained and we have plenty of them for your awesome vacation in Destin, as you enjoy the waters around Crab Island. All of our waverunner / jet ski rentals hold up to three people or 400 lb., whichever comes first. Our waverunner / jet ski rentals hold up to two adults at a time, or two adults and one small child. We have no rev-limiters on our rentals like other watersports rental locations in Destin, FL. 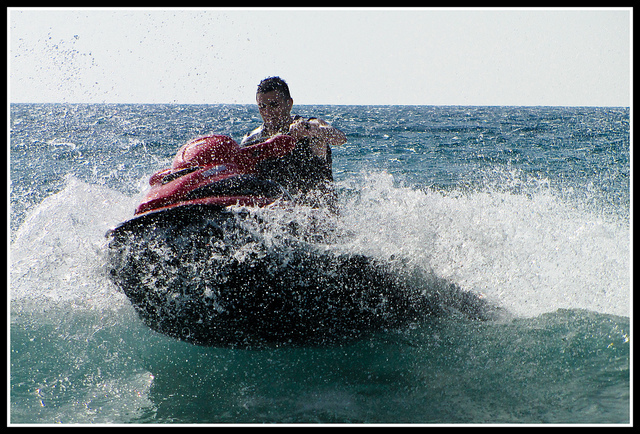 All of our waverunner rentals / jet ski rentals go from 50 MPH to 57 MPH. You’ll be going as fast as you can squeeze the throttle. Even if you have never tried jet skiing before, you will learn quickly! They are easy to operate, very stable, and lots of fun. The person signing the contract / waiver must be 18, have a valid ID, & credit card. A person aged 16 or 17 may operate a waverunner / jet ski if a parent or guardian 18 or older signs the contract / waiver for them . Life jackets (PFD’s) and fuel are included with all pontoon boat rentals and waverunner / jet-ski rentals. If the driver is born after January 1, 1988, they must present a boating safety education identification card issued by the Florida Fish and Wildlife Conservation Commission, or the equivalent from another state. Visitors from out of state who do not have a card issued by their home state can take a Temporary Certificate test. We do offer the temporary Boater’s Safety Education Course so you can obtain your temporary boater’s certificate. If you need to take the Boater’s Safety Course, please allow plenty of time for this, so that you can depart on time. You can go to www.boatus.org and get your permanent certificate. Military, Law Enforcement, and Teachers all receive 10% discount on their waverunner / jetski rentals. Thank you for your dedication! * Prices include fuel. Add 6% sales tax. Prices are subject to change. Call (850) 898-1204 for pricing & availability or book your jetski online!